Doubters may think Bigfoot should be consigned to oblivion, but Knute Berger argues that the creature deserves more research. 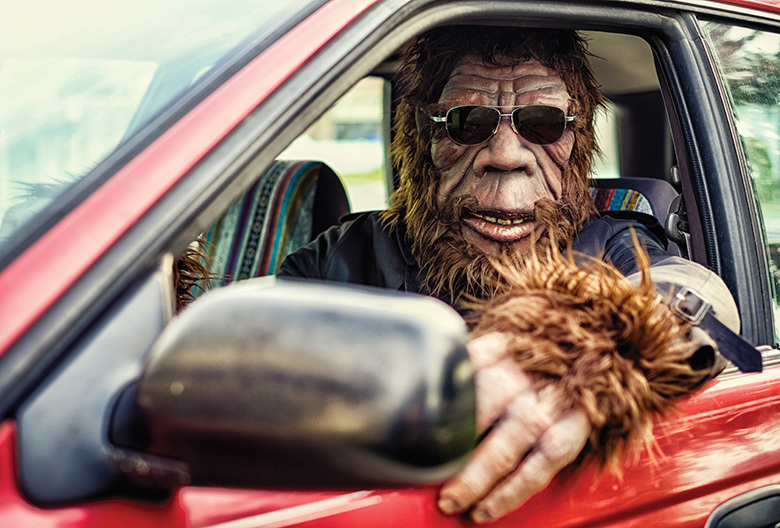 Believe it or not, Bigfoot scientists exist—but they have to keep their interest under wraps. Sasquatch—also known as Bigfoot—continues to be a symbol of the great Northwest. Fifty years after the famed Patterson-Gimlin film of an alleged Bigfoot walking along a northern California creek, the creature is most frequently seen as a piece of chainsaw folk art. Just outside of Index, Washington, on the way to Stevens Pass, the Chalet Espresso stand welcomes customers with a giant wooden Bigfoot holding a snowboard. On the Olympic Peninsula near Moclips, Sasquatch is a carved figure with a surfboard tucked under his arm. His image once evoked mystery and wonder. Now, he’s just another thrill-seeking bro. Mainstream science either considers the subject of Sasquatch’s existence as fraud, or a topic not worth investigating. Foremost among these academics is Jeffrey Meldrum, professor of anatomy and anthropology at Idaho State University. In a 2016 paper in the Journal of Scientific Exploration, Meldrum argues that creatures like Sasquatch, yeti and other “wild men” spotted around the world might not be anomalies, but rather what might be expected, given recent archaeology. Discoveries of ancient humans show that we modern humans overlapped with Neanderthals, Denisovans, Homo floresiensis (also known as the diminutive “Hobbit Man” found in Indonesia) and other human species. As recently as 30,000 years ago, he says, modern humans might have overlapped with as many as half a dozen other species. Meldrum reminds us that the human family tree is “bushy,” with many offshoots, many still unknown in the fossil record.